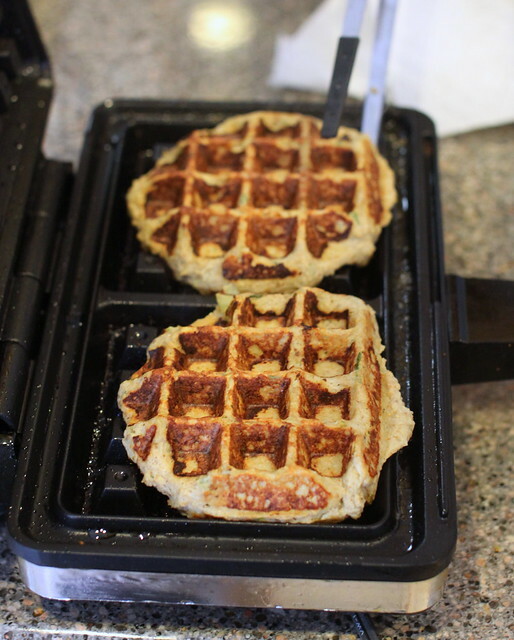 Liberally brush the waffle iron with olive oil. 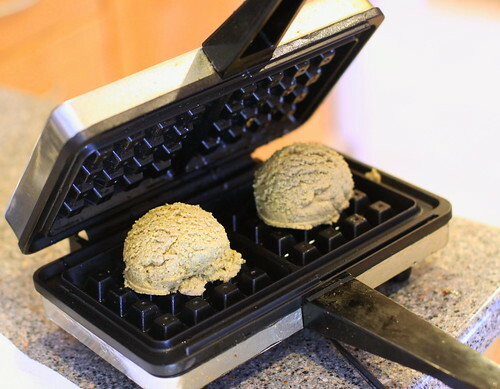 With an ice cream disher or a large spoon, place your Felafel batter onto the waffle iron. 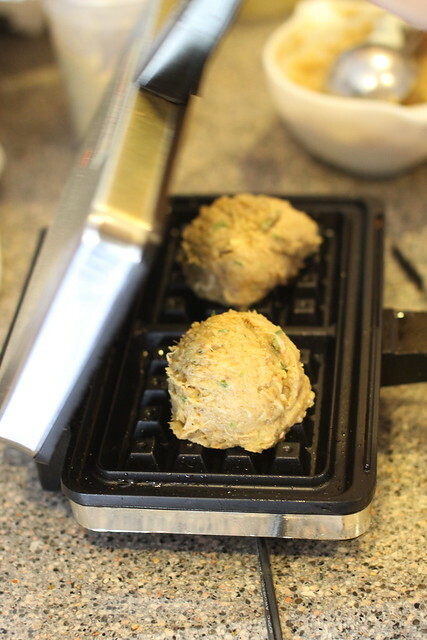 We used a commercial Felafel mix that we bought at a Middle Eastern grocery. This type is simply mixed with water and ideally you should let it sit overnight so that it gets fully reconstituted. 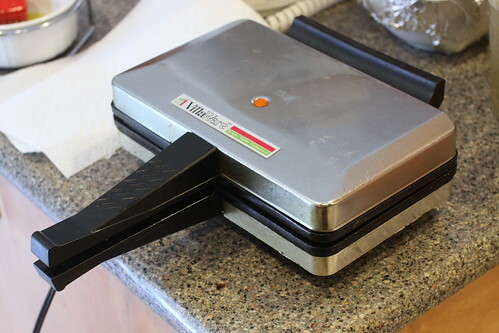 On our waffle iron, we cooked them for about 8-10 minutes a batch. We haven’t gotten this down to an exact science yet. Prepare your salads and accouterments. 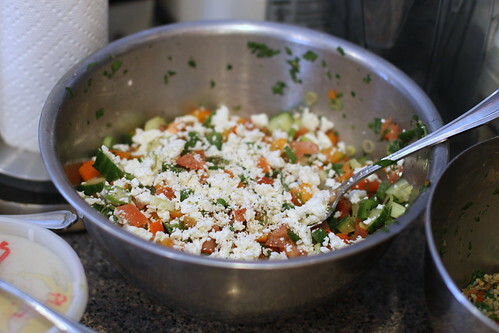 This is an Israeli Salad with red peppers, scallion, tomato, cucumber and feta cheese. 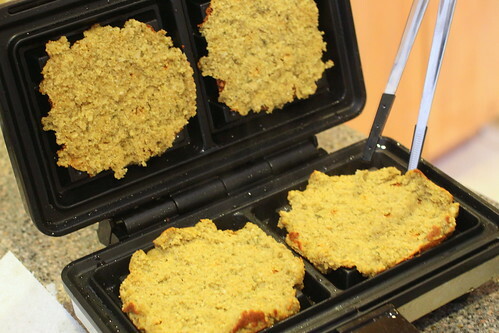 One of the things I’ve noticed about waffling falafel mix is that during unmolding, the Wallafels tend to separate. 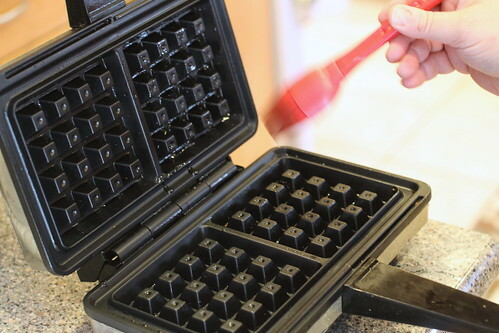 With our particular waffle iron this is probably unavoidable, but I will strive to improve the process. In any case, you want to cook them until the insides are cooked completely through. Fully cooked Wallafels. Keep these warm in the toaster oven. As you can see, our first experiment in Wallafeling resulted in some tragedy. We still ate the messed up looking ones. Next, the chicken. This is ground chicken meat which has been seasoned with a kebab spice blend mixed with finely chopped onion and green chile pepper. In our case, we used a Seekh Kebab spice blend that we bought at an Indian grocery, but you could use any spice combo you like. 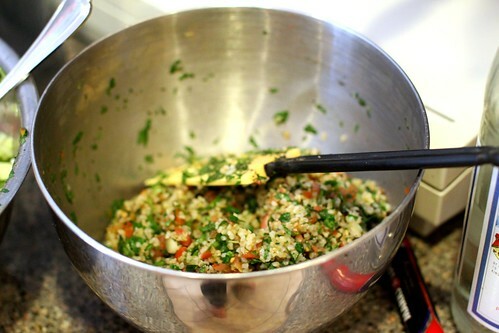 Middle Eastern seven spice blend would also work, as would just a simple Salt, Pepper, Cayenne, Coriander and Cumin mix. The Chicken was cooked for about 10 minutes. 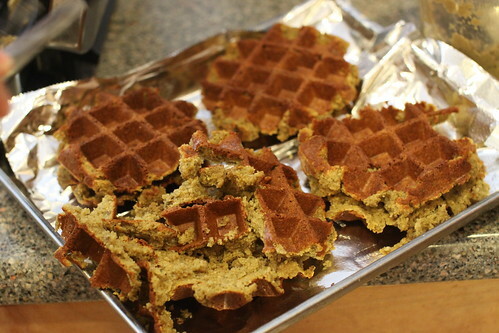 Amazingly, it came out as perfectly intact waffles. The finished product, Chicken and Wallafels. 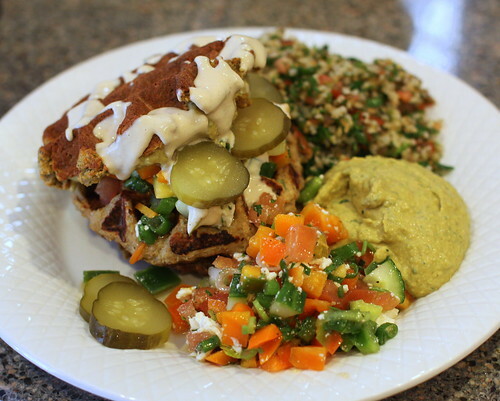 We placed a Wallafel on the bottom, topped it with a Chicken Waffle, and dressed it with our Israeli Salad, Pickles, and another Wallafel half, dressed with Tahini and served with salads and Hummus. This entry was posted on Tuesday, March 8th, 2011 at 4:21 pm and is filed under Food, General, Healthy Eating. You can follow any responses to this entry through the RSS 2.0 feed. You can leave a response, or trackback from your own site.